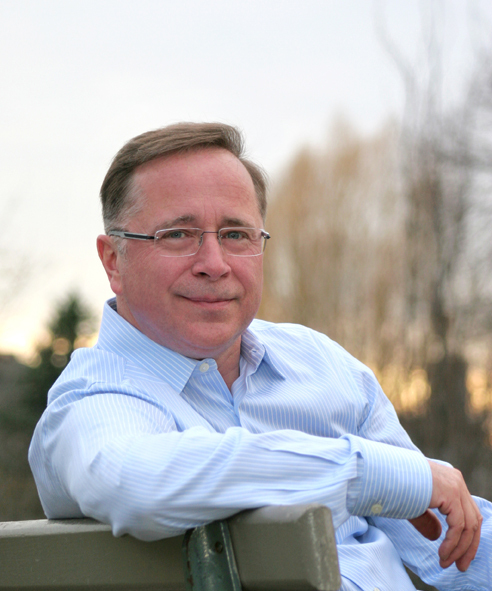 A message from Jean-Marc Hachey, Author and Online Publisher: At MyWorldAbroad (MWA), our team is committed to helping each client school develop and implement a strong marketing campaign. We want you, your staff and your students to derive maximum value from your school’s subscription to our site, so we’ve compiled the following list of marketing support materials to get you started. We’re proud to be partnering with your school and hope to make your marketing campaign as simple and effective as possible! By marketing the availability of MWA to your students, you are promoting the importance of global career skills to your students while reinforcing your school's internationalization strategy. Best wishes to all with this noble task! But, do more than just creating a link to MWA on your school’s Web site: The least effective strategy in marketing MyWorldAbroad to your students is to limit your efforts to online links. While this is a definite prerequisite for effective marketing, it is by no means enough. From a student's perspective, a link to MWA on a school's website is simply one of trillions of links available on the Internet. Students need to hear that their school recommends and endorses access to MyWorldAbroad. For the average student, it takes seven or more reminders (each semester) about MWA before they take the initiative and visit the site. Read on for simple and easy tips on how to promote access to MyWorldAbroad." Focus on three or four marketing strategies and implement these strategies each semester: Make sure that there is always someone assigned to marketing MyWorldAbroad each semester, especially when there is staff turnover. Implement a simple marketing plan during both the fall and winter semesters, and continue a lighter round of marketing during the spring/summer semester. Posters (print or electronic) and promo cards: We have customized these three Marketing Products specifically for your school. Display them around campus at the start of each semester and distribute them regularly, for instance during international events. Ask student advisors to distribute promotional cards during one-on-one advising sessions or invite student interns/ambassadors to distribute them in busy hallways, classrooms or cafeterias. E-mail & newsletters: Let students know about MyWorld via e-mail at least twice a semester. Consider adding a short sentence in the footer of all student and alumni newsletters about how to register for MyWorldAbroad. “Thinking about going abroad? The Career Office encourages students to build global career skills while in school. Access MyWorldAbroad’s 300+ expert articles and 4,000+ resources at www .myworldabroad.com/[your-school-domain name].” Alternatively, write an article based on one of our Quick Guides, or design a print ad for inclusion in your newsletter (see sample ad for a magazine or newsletter). Follow us on social media: Are you reaching out to students on social media? Are you looking for engaging career related content? If so, we have all the content you need. Social media feeds are a fantastic way to keep in touch with students and spread the word about the importance of international skills. Check out the MyWorldBlog, and follow us on Twitter, Facebook and LinkedIn to see and re-share feed content. (See the section below on Social Media for more ideas. NEW TOP STRATEGY: The Global Nudge Postcard Series is a set of vibrant postcards features bite-sized pieces of key advice to get your students thinking about going abroad and building international career skills. Print and share up to 12 of these attractive and informative cards. View samples: page-1, page-2, page-3, page-4. See all the details here. Invite all advising staff to attend staff training webinars once a year: Our training webinars are open to staff, student ambassadors/interns and anyone else you think might benefit from learning about MyWorldAbroad. We have three webinars offered regularly: Introduction to MyWorldAbroad, Marketing MyWorldAbroad to Students and Integrating MyWorldAbroad into Student Training Programs. Click here to find out more or register for a scheduled webinar. Contact our Client Representative to book a customized training session for groups of three or more. Ensure that every staff member knows what is available on the site, and how to guide students through the registration process. In addition, we have a PRE-RECORDED VIDEO: Mini-Introduction to MyWorldAbroad: a 19-minute pre-recorded video designed especially for student interns and advisors from career and study abroad offices. This is the fastest way to learn about the MyWorldAbroad Web site. The first five minutes cover the essentials of the site, and how you can help students use MyWorldAbroad. The following 14 minutes cover our overall philosophy and provide advice on how to help more senior or advanced students understand the international job search. Assign a go abroad advisor and create a MyWorldAbroad "champion" in both the Career Office and the Study Abroad Office: Our most effective client schools have a dedicated person who believes in MyWorldAbroad and oversees marketing elements. This person uses our product regularly, shows students how to use it, and promotes it availability at every occasion. Let our Client Service Representative know who these people are so we can include them in our staff mailing list (sent approximately six times a year). Build MyWorldAbroad products into your go abroad systems and training programs: Our training products include: Quick Guides, self-evaluations, international quizzes, lesson plans and more (for more details, see the section on Training Products). Cross-promote MyWorldAbroad during international events, such as International Education Week, cross-cultural fairs, go abroad fairs or when an internationally-focused speaker is visiting or lecturing. Include this line as a footer in the marketing material for the event: If you are interested in this event, be sure to access www.MyWorldAbroad.com/register for expert articles and resources to help you go abroad. (See more details on this idea below.) You may also want to set up a MWA booth during your campus career or study abroad fair (view project description). Designate staff members as go abroad subject matter experts: Both the Career and the Study Abroad offices should have a designated “expert” for advising students about going abroad and letting them know about MyWorldAbroad. Each summer, please contact to our Client Representative to let us know who your “experts” are. This way we can add them to our mailing list and keep them informed about relevant updates. Work with faculty and other departments: There are plenty of people on campus with an interest in promoting global career skills. Encourage professors teaching international subjects to tell their classes to register for MyWorldAbroad. Faculty members have a unique opportunity to access students on a regular basis and reiterate the importance of building global career skills. Have one of your student ambassadors/interns build and maintain a list of “internationally-oriented faculty” and write to them twice a year about the availability of MyWorldAbroad. Distributing promo cards in busy hallways, at student cafeterias and during international events (see more details below). Organizing a poster campaign with our customized school posters (print version). Distributing Quick Guides at international events on campus. Making presentations about MyWorldAbroad and their experiences overseas. Making brief announcements in internationally-oriented classes about MyWorldAbroad and distributing the Quick Guide 24 Ways to Go International (see more details below). Providing peer-to-peer counseling about going international. Liaising with student clubs on campus to promote MyWorldAbroad (see more details below). Job Description for Interns Marketing MyWorldAbroad: Note that page 3 of the Workshop Outline (mentioned above) contains all the marketing ideas listed on this page. Tap into social media: Blog posts, tweets, and status updates have become a great way to connect with student populations. MyWorldAbroad offers daily and weekly posts to keep students inspired and informed. Check out the MyWorldBlog, follow us on Twitter, Facebook and LinkedIn. Like and share our content, or encourage students to follow our accounts themselves. Share our Quick Guides via social media: Are you looking for additional content to share with students via social media? Why not share a new Quick Guide each week? Client schools have full reproduction rights to the guides and the URLs are not password protected. Students do not need to be logged in to access the guides, but you will need to log in to collect the URLs in order to share them. to access the Quick Guides and their URLs. Review our Stories From Abroad and share your favorites with student subscribers on your social media feeds: When a student from your school publishes a story with us, share it on all social media platforms. When you send invitations to students to connect with your accounts on social media outlets, why not include MyWorldAbroad’s feeds as an additional suggestion? This way, students can connect to us right from the get-go. Create your own marketing products with MyWorldAbroad logos and images: See our media page for a full list of our logos and images of Jean-Marc Hachey (founder of MyWorldAbroad). Consider designing a print ad or web page (see sample ad for a magazine or newsletter). Set up a desk sign next to your office receptionist saying "ASK ME ABOUT GOING ABROAD" and give the promotional cards to students who ask for info. Ask your office’s student ambassadors/interns to distribute these promotional cards on a weekly basis and/or whenever they have free time. Hand out to students attending internationally-focused classes. Client schools have full reproduction rights to our popular Quick Guides: The URL for each Quick Guide is not password protected, so you can provide direct access to students (i.e. students do not need to be logged into MWA to access our Quick Guides).You can therefore easily place links on your school's website, in your social media feeds, newsletters, pre-departure orientations, re-entry orientations and online workshop material. Sample wording to showcase our Quick Guides as a regular feature in newsletters and social media: We have excellent student-friendly sample wording to accompany Quick Guide links. Highlight individual Quick Guides by using our sample wording (2 sentence descriptions) to create a regular feature in your newsletter or social media feeds. Build our Quick Guides into your training programs: Hand them out during Career Center workshops, such as “How to Intern Abroad,” “How to Volunteer Abroad,” “How to Find an International Job,” “Pre-departure and Re-Entry Orientation Programs.” See Training Products at the very bottom of this page for more info. Print & Distribute Quick Guides: Distribute them in public waiting areas, during international events or in international courses. Print out copies of your favorite Quick Guides and leave them for students to peruse in the lobbies of your Career Center, Study Abroad or International Student offices. The footer at the bottom of each Quick Guide lets students know how to register for free access to MWA. Click here to access printable Quick Guides. Distribute your school’s customized MyWorldAbroad poster when handing out Quick Guides: This way, you're sure students know that they have FREE access to MyWorldAbroad. Publish articles, info and Quick Guide excerpts in school papers: Use the suggested press release, get a student to write a review or publish an excerpt from a Quick Guide as a way of spreading the word in print. This is an easy way to promote access to the site mid-semester. (Please note that all printed Quick Guide excerpts must include the following line: “This excerpt printed with permission of ©MyWorldAbroad by Jean-Marc Hachey. All rights reserved.”). Promote global career skills to first year students: Both the Career Center and the Study Abroad Office can take a broad approach to encouraging students to think internationally starting from the students' first day on campus. Consider distributing our Quick Guide below in the information packages of first-year students when they arrive for orientation. The Quick Guide can be printed and distributed, or it can be e-mail or sent out as a link (note that the URL for Quick Guides are not password protected, so the link will work anywhere). QUICK GUIDE: 10 Easy Ways For First-Year Students To Build International Skills. Since the above Quick Guide is only one page long, consider printing your school’s customized MyWorldAbroad poster on the reverse side of the page. Promote global career skills to students taking international courses on campus: Career Centers and Study Abroad Offices could have one of their student ambassadors/interns compile a list of all the international courses being delivered on campus and contact their professors and ask them to distribute the Quick Guide linked below to each student in the class. Any student who is taking international courses would have a natural interest in the MyWorldAbroad site and would benefit from our advice and resources. The Quick Guide can be printed and distributed, or it can be e-mail or sent out as a link (note that the URL for Quick Guides are not password protected, so the link will work anywhere). QUICK GUIDE: 24 Ways To Go International. This Quick Guide is also available as an HTML article in MyWorldAbroad (but you must log in to access). 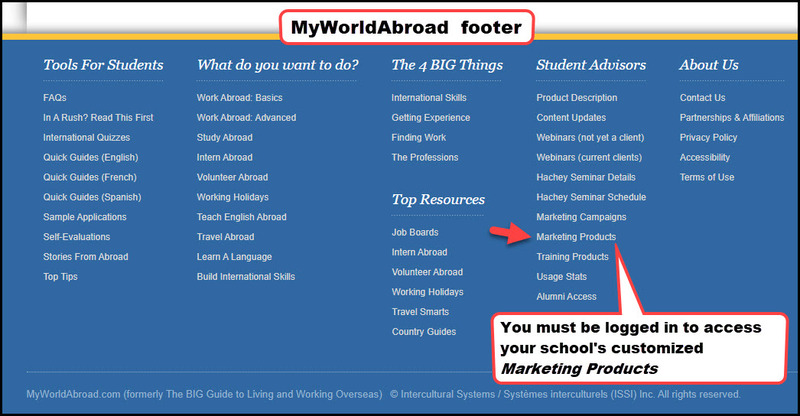 Consider attaching your school’s customized MyWorldAbroad poster with the Quick Guide above. Reproduction rights: Our Quick Guides, International Quizzes and Stories from Abroad must be reproduced in their entirety and may not be edited for inclusion in other articles without the written permission of the publisher. Short excerpts may be used to substantiate a review, promote or link to the site. 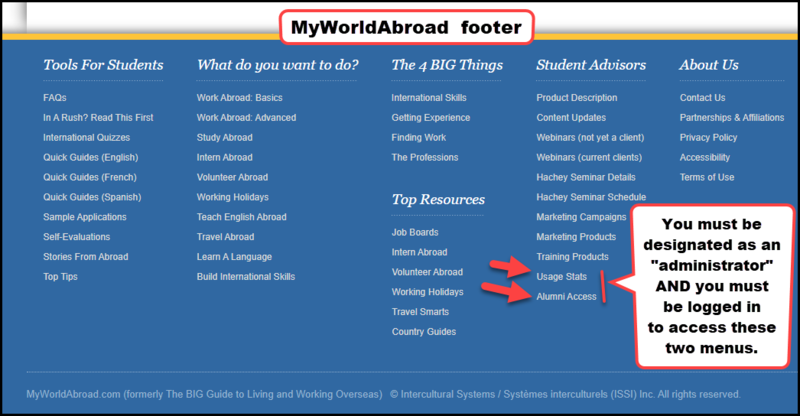 MyWorldAbroad administrators at your school: A few staff members are designated as administrators within our system and they have access to two extra menus in the Student Advisors column in the MyWorld footer: (1) Alumni Access and (2) Usage Stats (view). If your school has not yet assigned one or more administrators, contact our Client Service Representative by e-mail. Invite alumni to access MyWorldAbroad: If your alumni have school email addresses, they are free to access MyWorldAbroad in the same way as your students and staff. If your alumni do NOT have school email addresses, they can easily be given access by a staff person at your school who has been designated as an administrator in our system. These administrators have access to the Alumni Access in the footer of our Web site under the Student Advisors column (view). Keep tabs on your school’s usage stats: It's easy to find out how many students have registered for MyWorldAbroad. Consider tracking usage before and after your information seminars, email campaigns or international events to chart your success. To access the User Stats menu, you must be designated as an "administrator" in our system. See these instructions about how to access and interpret MyWorldAbroad usage statistics. (NOTE: Usage stats may take 30+ minutes to generate.) REMINDER: Good usage stats are directly proportional to how much you market MyWorldAbroad; a simple link on your Web site isn’t enough to build momentum. Students need to hear about our service at least seven times a semester for it to make a strong impression. Carry out year-long marketing pushes: Students find MyWorldAbroad (MWA) useful throughout the school year, including over the summer months. Many students use the site after returning from their time abroad, to help them make sense of their experiences and plan their next steps. We’re there for them during their application process, pre-departure prep, international experience and re-entry process. For this reason, it’s important to maintain your MyWorldAbroad marketing push throughout the year and within all your go abroad training programs. Activist Receptionists [TOP IDEA]: A few of our clients schools have empowered their receptionists (or career librarian if your office is large enough to have one) to promote MyWorldAbroad. The receptionist is given the responsibility of promoting and marketing the availability of MyWorldAbroad to all students who walk into the career office. The receptionist has a sign on their desk that reads: “Ask me about going abroad.” Alternatively, there may be an additional small sign attached to the bottom of your school’s MyWorldAbroad poster that reads “Ask the receptionist about how to go abroad.” When a student expresses an interest, the receptionist then provides the student with a five-minute introduction to MyWorldAbroad: Two minutes to help student create a MyWorldAbroad account (AN ESSENTIAL STEP); three more minutes for an introduction to MyWorldAbroad (review the main menu items: What do you want to do?, The 4 BIG Things, Stories from Abroad, Quick Guides); and the receptionist then hands the student a take-away document (such as a MyWorldAbroad poster, promo card or a relevant Quick Guide). Set up a MWA booth at your career or study abroad fair [NEW]: A good way to let students know about free access to MyWorldAbroad is to set up a MWA booth during your campus career or study abroad fair (view project description). Include the MWA promo video on your school’s Web site or electronic bulletin board [NEW]. You can use our generic version (view and copy the URL link), or simply contact us to create a customized version of the video, which includes a final image informing students of how to register for MWA at your school (see last screen on sample video). Faculty partners: Professors and lecturers who have international credentials can easily connect with students and let them know that they have free access to MyWorldAbroad. Profs teaching internationally-oriented courses or those who organize study abroad sessions are the most likely to be willing to help promote MyWorldAbroad to their students. Cross-promotion with other international events on campus: Consider “piggy-backing” on upcoming international events to market the availability of MyWorldAbroad. Cross-promote with International Education Week (in November of each year), International Development Week (February of each year in Canada), career fairs, volunteer or study abroad fairs, workshops, etc. Work with the organizers of these events to insert a MyWorldAbroad registration footer and marketing message on all their materials. Consider adding this sentence to your website: “The Career and Study Abroad offices encourages students to access MyWorldAbroad for expert go abroad advice and resources.” [Link to your school’s MWA-registration page at www.myworldabroad/[your-school-domain-name]. Use quizzes to promote registration: Set up a bank of computers during an international event on campus, or invite students to connect wirelessly. Have students register for MyWorldAbroad and then complete one of the many international quizzes. Offer small prizes (given randomly) and print out scores using our Master Score Card page. You might also have one or more computers in your Study Abroad Office waiting area where students fill out quizzes before or after they meet with advisors. Get creative and use quizzes to motivate or evaluate students before, during or after their time abroad. Encourage your top students to submit a Story From Abroad: MyWorldAbroad has had fantastic feedback for the quality of our peer-to-peer content, Stories From Abroad. Our editors work directly with students to ensure that submissions are of top quality and can be used for professional purposes in the future, and schools are proud to be able to share their students’ success stories online. We even offer a $25 gift card as an honorarium. Our experience indicates that students respond best to personal appeals for story submissions from school administrators. If you know of a bright energetic student who has traveled, worked, volunteered, interned or lived abroad, encourage them visit the site: How To Submit A Story. 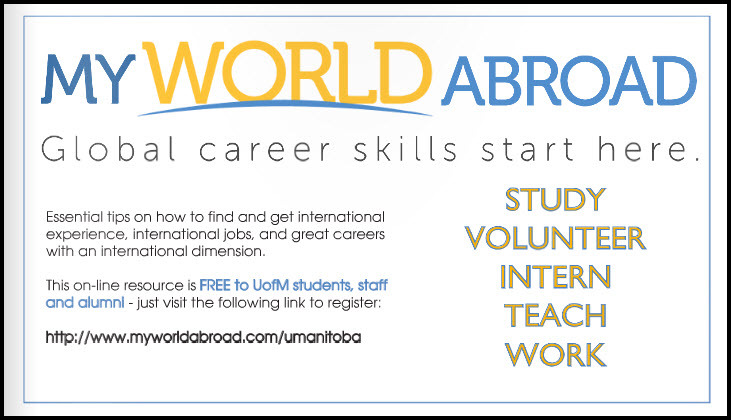 Work with international student clubs on campus to help promote the availability of MyWorldAbroad to their members. Have one of your student ambassadors/interns research which clubs on campus have an international focus, and work individually with each of them to promote the availability of MyWorldAbroad to their members. Ask them to promote MyWorldAbroad on their Web sites, during their events or via a mass email and social media to their members. Ask them to display or distribute a few of our Quick Guides. Consider attaching your school’s customized MyWorldAbroad poster with the Quick Guide. Promote global career skills to international student on campus: Your international students on campus are already undertaking their own international experiences abroad by studying at your school. Since we provide a universal approach to international job hunting and building international experience, they can derive just as much benefit from our site as local students heading overseas. QUICK GUIDE: Career-Boosting Strategies for International Students Studying in North America. This Quick Guide is also available an HTML article in MyWorldAbroad (but you must log in to access it). Consider attaching your school’s customized MyWorldAbroad poster with this Quick Guide. Support campus internationalization: MyWorldAbroad is a supportive partner for numerous departments concerned with campus internationalization. Many schools have adopted an internationalization strategy by promoting global citizenship and working towards internationalizing the student experience while in school. The Study Abroad Office and the International Student Office are obvious pillars in supporting a school’s internationalization strategy. However, Career Offices may sometimes be at a loss as to how to support campus internationalization. One easy and cost effective remedy is for the Career Office to promote “global career skills” while promoting the student go abroad experience. The Study Abroad Office and the International Student Office can also strengthen their roles by highlighting the long-term value of acquiring “global career skills” through their programs. MyWorldAbroad has much to offer in this regard. Every aspect of MyWorldAbroad is designed to strengthen the student internationalization experience by consistently focussing on “global career skills” with our advice and resources. No other site has this breadth and reach in terms of helping students derive the maximum “career value” from their time abroad. By focusing on “global career skills,” MyWorldAbroad helps students prepare for work in the new global economy. We help schools graduate a pool of internationally-experienced students and this, in turn, helps build up the global competiveness of home-based firms, government departments and local NGOs. As such, when a department is promoting the availability of MyWorldAbroad to students, it is also strengthening internationalization objectives and strategies on campus. Invite author Jean-Marc Hachey to speak at your school: Schools that subscribe to MyWorldAbroad receive special pricing for Jean-Marc’s on-campus seminars. He can present up to three seminars geared towards motivating students to go abroad and build international skills. Jean-Marc’s seminars are also a fantastic way to boost usage of the MyWorldAbroad site. Students always leave the seminars inspired, with a renewed enthusiasm for going abroad. Client schools often request three different webinars: one geared towards the general student population, another for international students, and another session for student advisors and interested faculty. See Hachey Seminar Details for more information. Encourage international clubs on campus: School administrators should consider fostering the establishment of any number of different types of international clubs on campus. Internationally-oriented clubs on campus provide formal networks for students to gain international programming experience, leadership experience and, ultimately, a competitive edge when crafting an international resume. Read our article about how students can launch an international club on campus, and see our resource list of potential clubs. Career Centers and the Study Abroad Office should consider actively supporting the establishment of these clubs by reaching out to students and possibly providing a small start-up grant as a means of encouraging student organizers. For more information, check out this article: International Clubs On Campus and this companion resource list: International Associations With Clubs On Campus (your must be logged in to MyWorldAbroad to access these). White Paper on Campus Internationalization: We are very pleased to re-publish our White Paper entitled “International Academic Mobility: Two Decades of Practice” written by Daniel Guay, a leading thinker and innovator who focuses on how universities can organize themselves to promote international exchanges on campus. VISIT our Training Products page to learn more. Our training products can be used in multiple areas: individual student advising, * pre-departure and re-entry orientations, * workshops on any of our eight go abroad areas in Getting Experiences (view), * workshops on international job-hunting, * full credit courses, * international events.